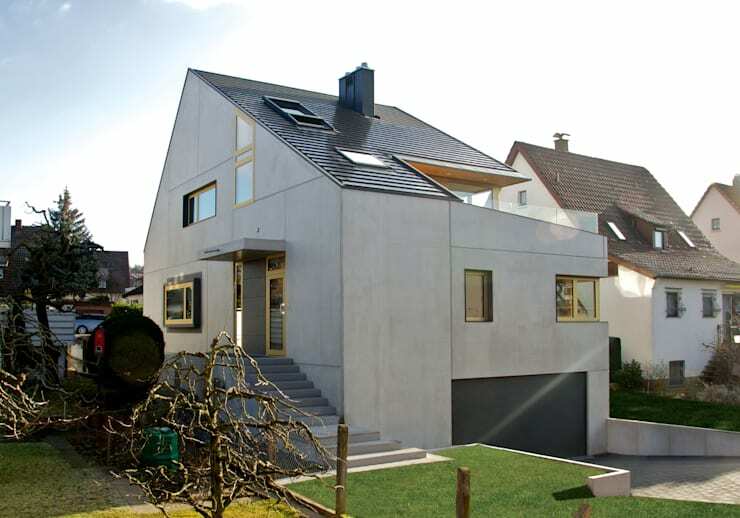 Today, we are going to visit Germany where architect professionals UDO ZIEGLER Architects have built a gorgeous family home that takes on different proportions, resulting in a very stylish look and feel. The designers have truly used shape and volume to play with this design, which takes on different perspectives and has a very unique appeal. As we explore this cutting edge home, we will also discover how a simple design can end up being the most effective as well as how beautiful a minimalist design can be. We will explore this home from the outside in, but be warned, you may get a little jealous! This is a home that any Canadian family would be delighted to live in. From the get go, we can see how the designers have used shape and volume to their advantage. The home spreads over several storeys, taking on different perspectives, depending on which angle you look at it from. The very eclectic shape is softened by the cool, concrete tones and the yellow finishes, with these colours working together in perfect harmony. We can also see that there are plenty of windows, doors and skylights, ensuring that there is a wonderful connection between the interior of this home and the exterior spaces. The house was assembled out of prefabricated concrete slabs that were eventually insulated. Compared to other multi-layered systems, concrete is more cost-effective and allow an outer wall thickness of 35 centimetres. From the back of the home, we can see the ground floor spills out onto a beautiful, wooden terrace. This the perfect area for relaxing in the sunshine and enjoying the fresh air, while the kids play on the well-manicured lawn or in the trees. This side of the house also takes on a more uniform shape, with a sharply angled roof that looks very dramatic against the skyline. Again we can see how there is an abundance of windows and skylights throughout the design, which makes for a very light interior, which we will soon discover. Have a look at these other ways to bathe your home in natural light. If we head inside the home, we come across a very industrial chic staircase with a curved metal banister and cement stairs. This is a perfect example of how the most simple design can be the most effective, with the most basic and raw materials used. A staircase is a functional element in a home, but here we get a real sense of how it can contribute in terms of style and decor. The simple grey, black and white tones area also very appealing in this space. The bathroom also takes on more neutral tones with the designers opting for grey floors, white walls and features and light wooden finishes. 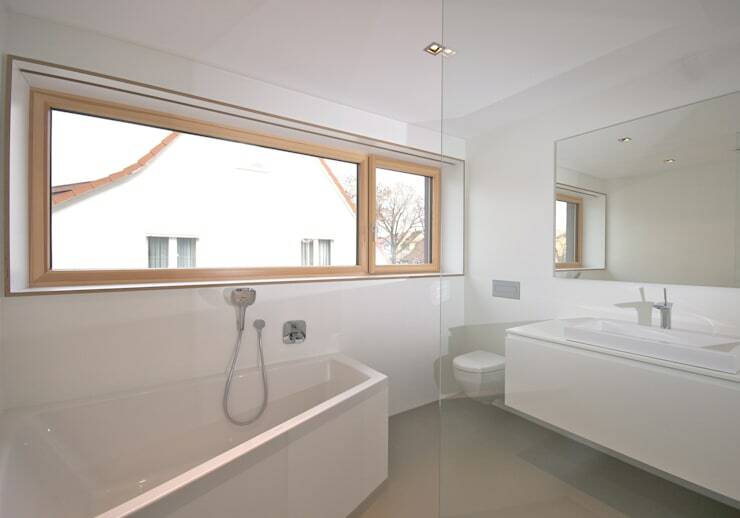 White bathrooms create a very hygienic and clean look and feel, which is very appealing for this space. Remember that your bathroom is meant to feel peaceful and tranquil, where you can relax in a bubble bath or brush your teeth in peace. These soft, neutral tones contribute to the serenity. We can also see that there is an abundance of natural light in this space thanks to the large, rectangle window that runs along the wall, however it doesn't compromise the privacy of the family thanks to its positioning. In this part of the home, we come across a simple room that has sunlight and fresh air flowing through it. 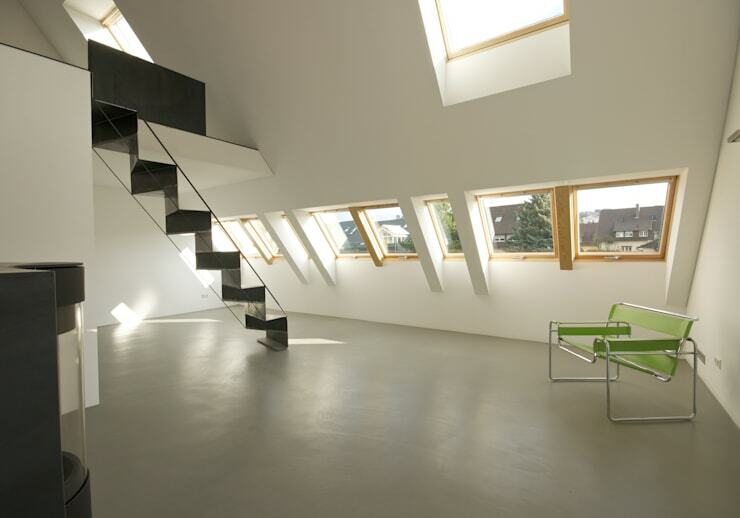 The grey floors and white walls once again make for a very sophisticated yet minimalist design. You'll notice that this room features a Marcel Breuer-desidnged Wassily Chair. it's bright green hue injects colour and a burst of personality into the space. Remember that if you have a neutral colour palette in your home, you can always add a touch of vibrancy. The stylish staircase is another beautiful feature in this room, once again proving that functionality and style can collide. 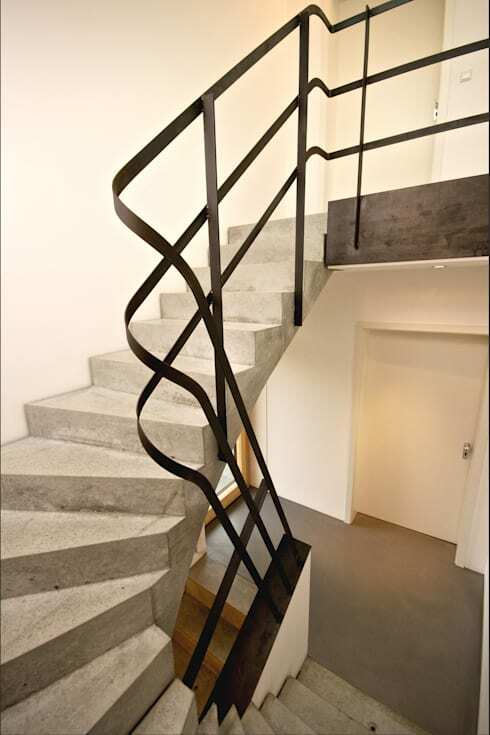 The metal staircase creates a zigzag through the air, leading up to another loft space. The dark metal tones contrast beautifully with the lighter shades. 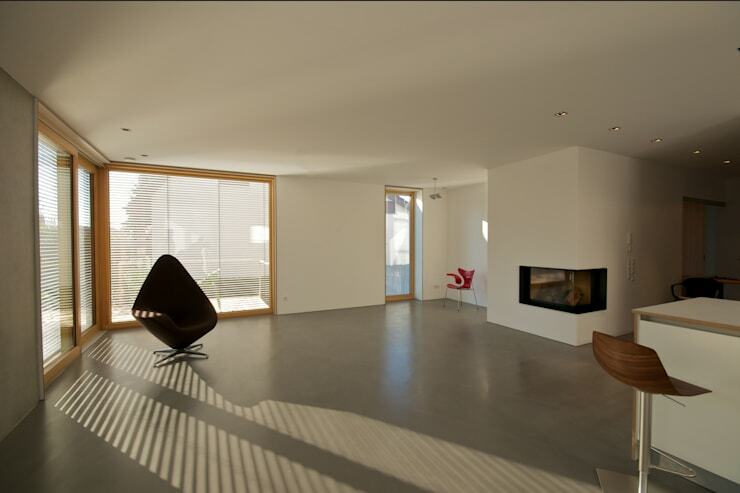 We end off our tour in the living room, which is also simple and minimalist with its grey floors and white walls. The highlight here is the L-shaped fireplace, which enhances the wall and the design of the room, while offering the family a cozy and warm area during winter. Fireplaces are a great addition to any home, especially in Canada! Have a look at these hot fireplaces for the modern house for inspiration. This is a home that proves just how a simple house can take on grand proportions. 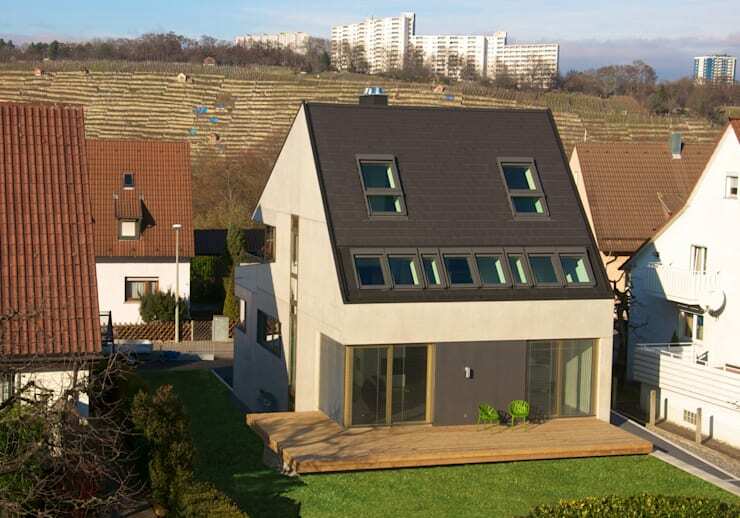 If you've enjoyed it, you'll love this modular house in minimalist style.